These sneakers are definitely a new favorite. If you follow me on social media, then you hopefully saw me singing their praises last week. I saw these babies at the mall, and I bought them without even trying them on because they were just that cute. Notice the laces! They are like ribbon! And they are crazy comfy! They come in black too, but I loved this grey. They are made for running, but these are going to be my “run around town while looking cute” shoes. I’ve worn them several times this past week with jeans, but look how cute they are with our favorite joggers! Also, I get asked frequently about what no show socks are my favorite, and you can find them HERE. My friend Cassie’s new RESORT line launched at Nordstrom on Tuesday! Did you see my post? 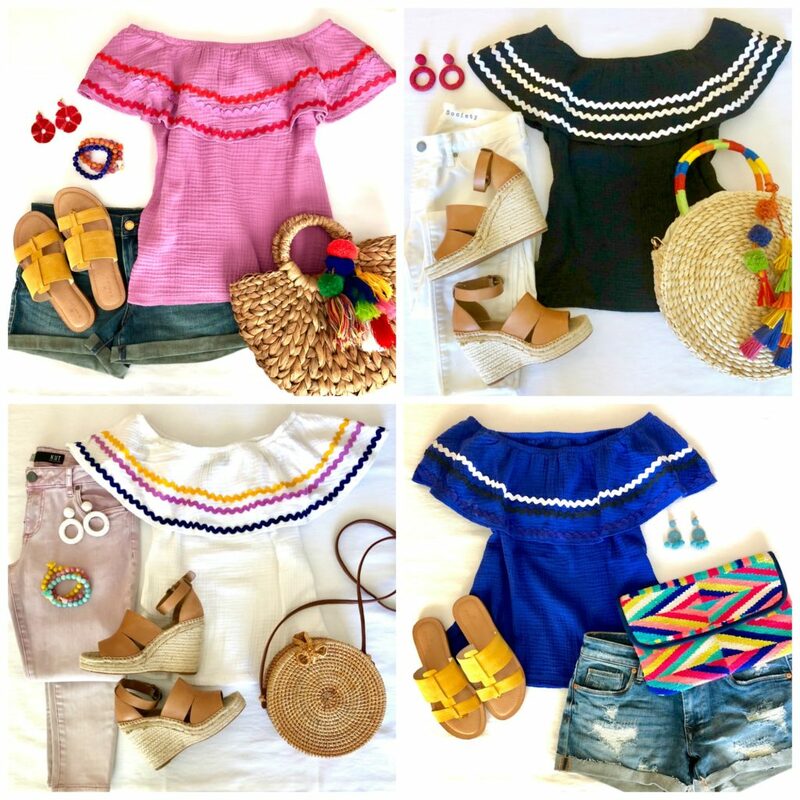 I highlighted my two favorite tops and showed you lots of different ways to style them with tons of amazing shoes, bags, and accessories. 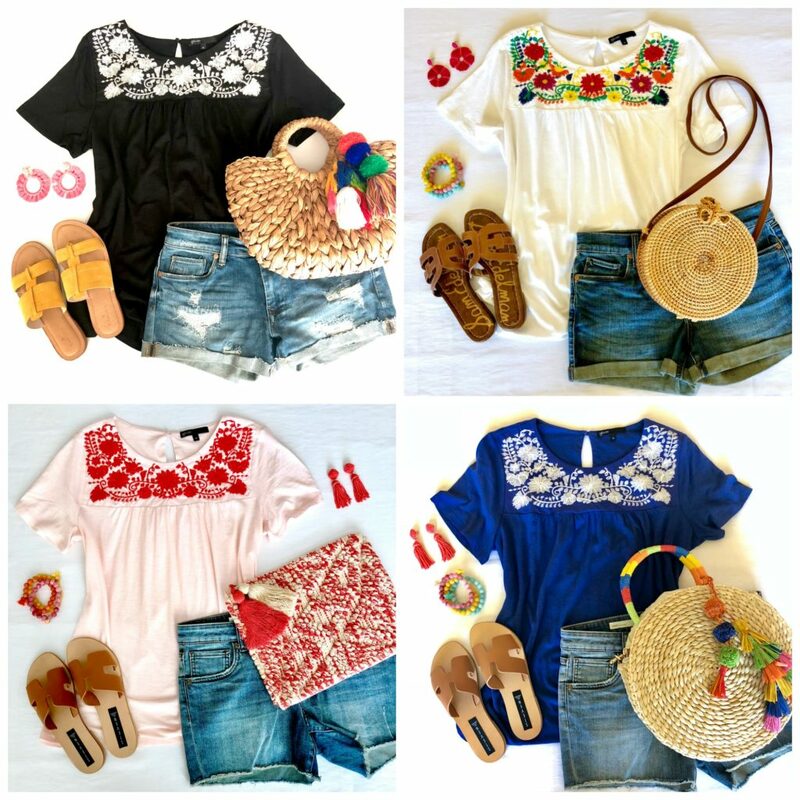 My #1 pick is this darling embroidered top (plus size here). I love all 4 colors and can’t pick a favorite. Click HERE to see me in the top, read all my thoughts, and see my sizing tips. My #2 pick is this darling rickrack little number (plus size here). Click HERE to see me in the top, read all my thoughts, and see my sizing tips. I love all of them, but I think the pink and red is my fave! I wanted to take a minute today to give some love to these lilac jeans. 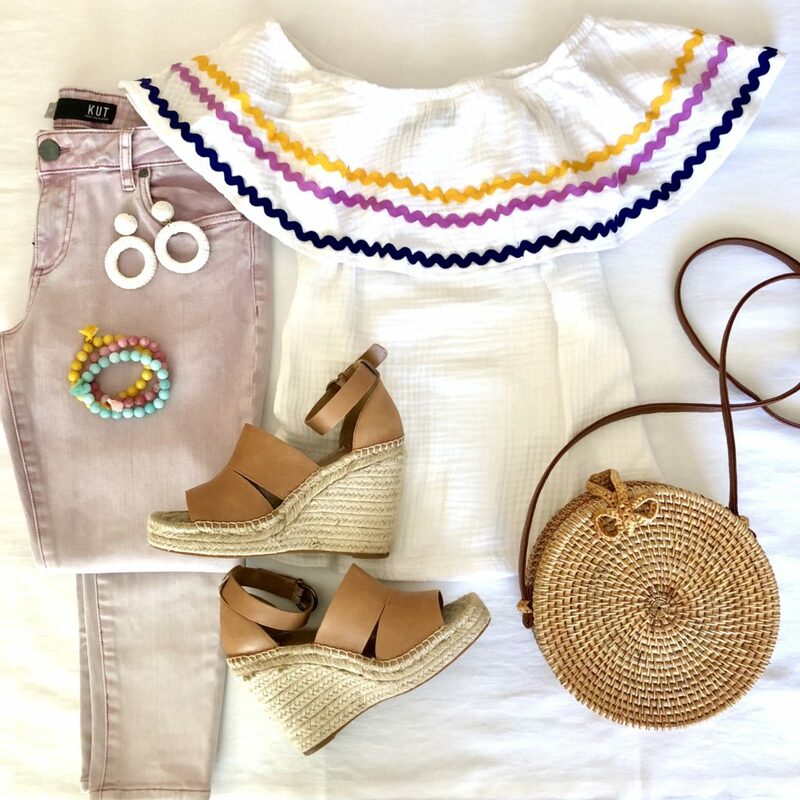 This top will of course be great with white jeans and regular denim, but I thought pairing it with this lilac pair made it extra special. Y’all know that I love the brand KUT from the Kloth (hello must have denim jacket that I’ve been wearing several times a week for 5 years now), and I’m SO EXCITED to now be a brand ambassador! You are used to seeing their items on me quite frequently, but I’m now just going to be making more of an effort to draw your attention to my favorite KUT items. Like these lilac jeans. They are stretchy, comfy, figure flattering, and have me all sorts of ready for Spring. For size reference, I went with a petite in these so they would be ankle length on my 5’4″ frame. I sometimes size up when I grab a petite, but I stuck with my typical 4s because they are quite stretchy. 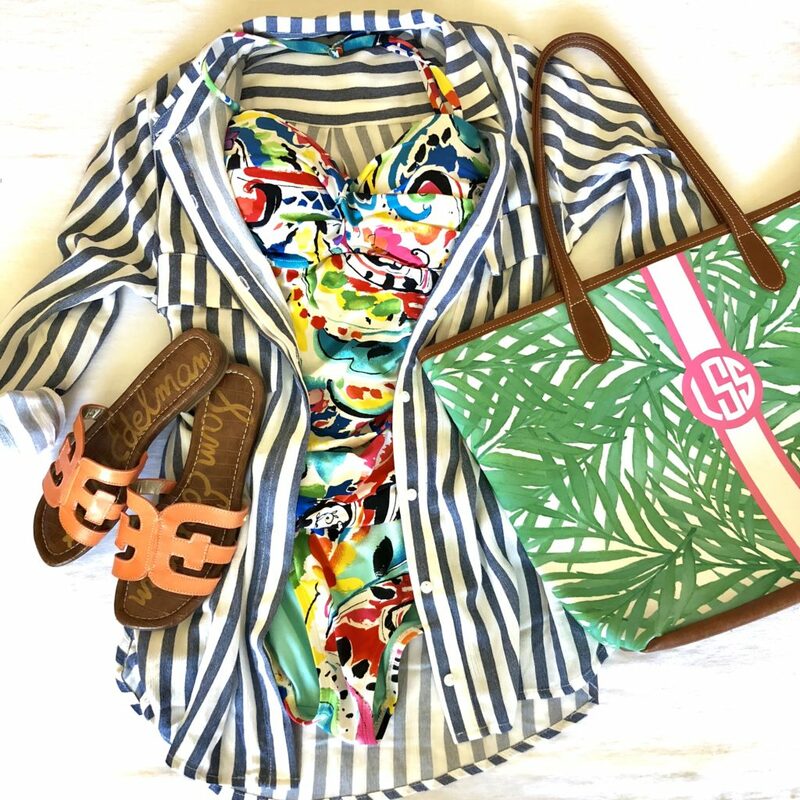 The 4P is perfect for me, and I can’t wait to wear these all spring and summer long. 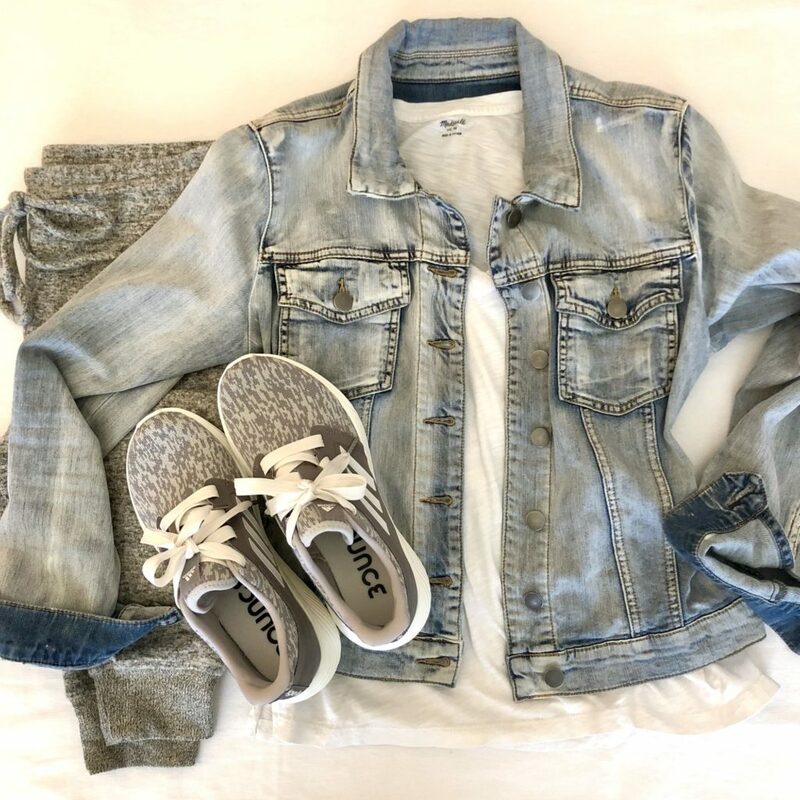 I love the idea of wearing them super casually with just a white tee, denim jacket, and converse too. My must have wedges are back this year and come in 3 additional colors. THESE WEDGES ARE INCREDIBLE. They are very comfy, true to size, and can easily be dressed up or down. These raffia earrings are big, but very lightweight! They also come in a sunshine yellow and a hot pink. Here are some more pieces from the collection that I didn’t share on Tuesday. This simple scoop neck tank is great on it’s own and for layering, and these cute little drawstring shorts are perfect for days by the pool! 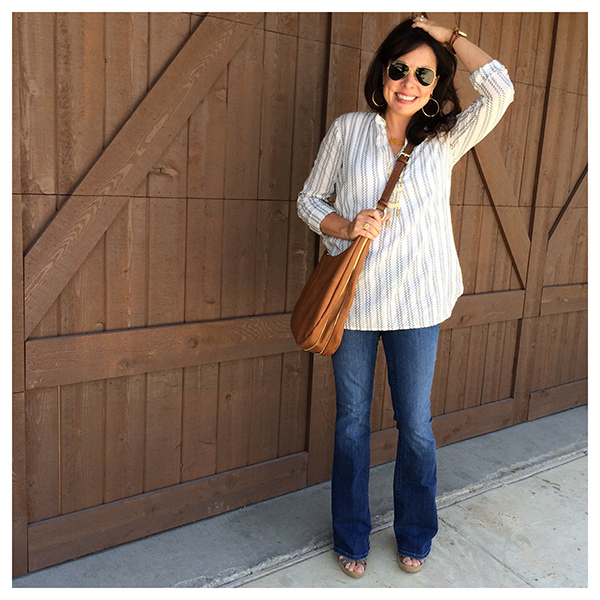 This striped tunic is another favorite for me. I’ll definitely be wearing it with white jeans and wedges, but it’s just as cute thrown over a swimsuit as a cover up! 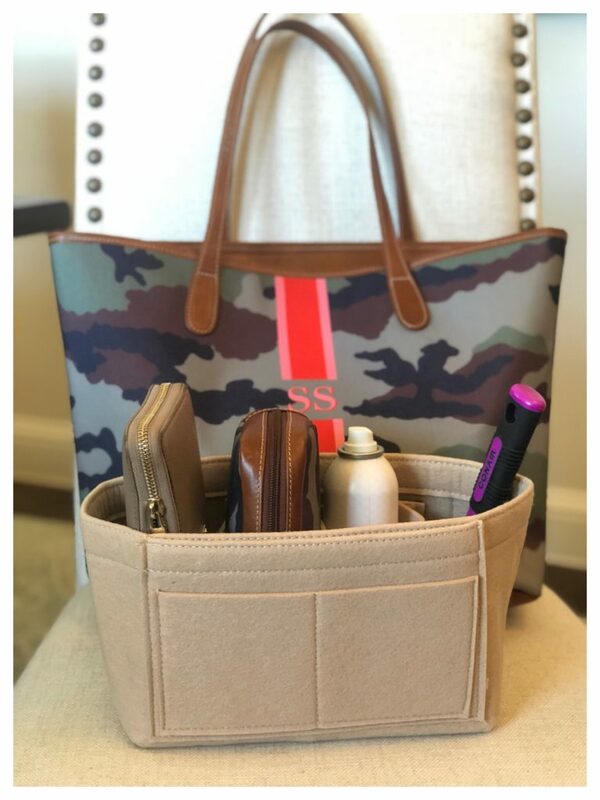 And as always, use the code STMTSAVE10 for 10% OFF your purchase at Barrington bags. And I’ve got some great news, my favorite denim shorts that I’d used when styling a lot of the resort collection were out of stock earlier this week and last with some popular sizes. Well, they appear to be restocked! Hurry! Here’s a picture from Cassie’s last collection. Click HERE for the shorts. They are the best denim shorts I’ve ever owned. True to size, but size down if between sizes. So I’ve been talking about and working with Brandless for about 5 months now. I continue to talk about them, because I truly love the brand, what they stand for, and their quality products. Click HERE to get back to my first post back in September if you want to know more about the brand itself. Today I’m just going to talk about some of my current favorites. I find that I now have enough Brandless product favorites that I’m reaching for at least 1 product a day. And I’m so excited, because they just added pet products! And although I have no use for them, they also added baby products too! This salad is delicious. 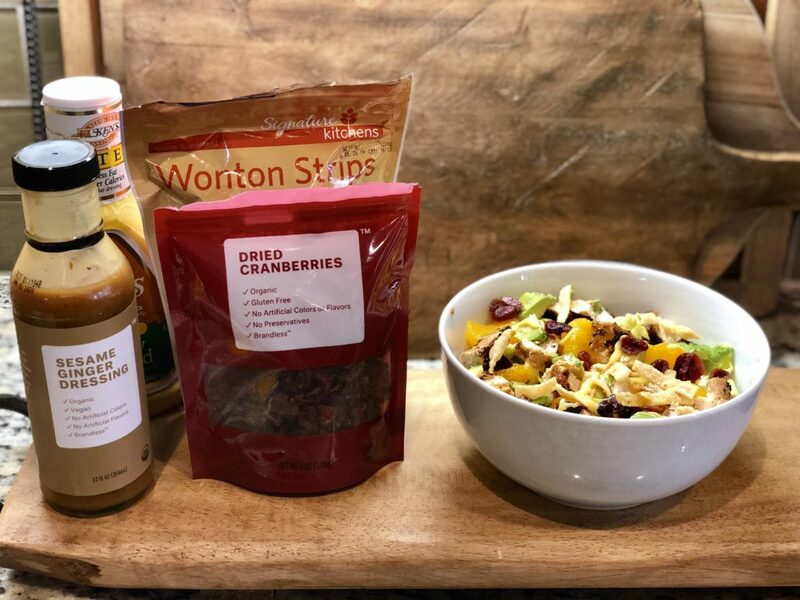 It has butter lettuce, mandarin oranges, canned pineapple, 1/2 an avocado, Brandless organic dried cranberries, Wonton strips for crunch, and a little bit of honey mustard dressing as well as some Brandless organic sesame ginger dressing. You will LOVE this salad. 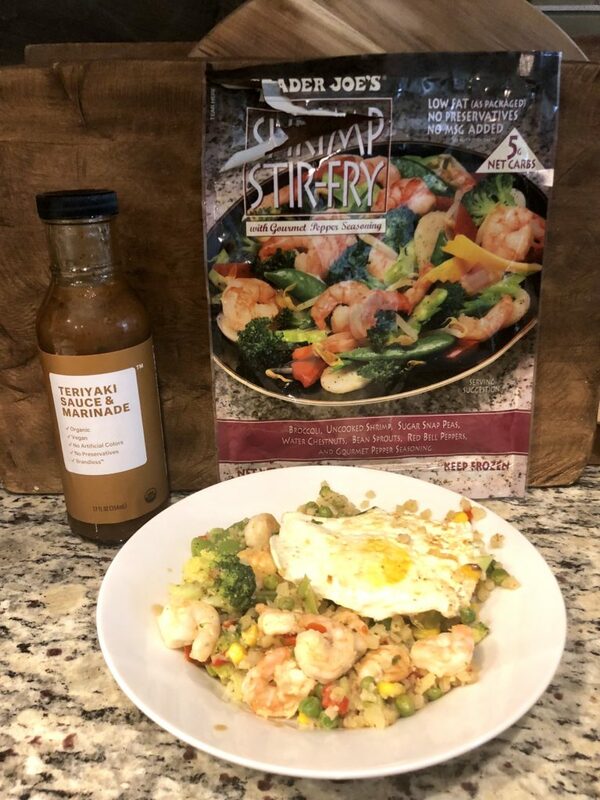 Another GO TO lunch of mine right now is cauliflower rice stir fry, topped with this shrimp stir fry and a fried egg. It’s fine on it’s own, but it’s soooooooooooooooooooooooo much better with the Brandless organic teriyaki sauce and marinade mixed in. We love using it to marinate chicken before we throw it on the grill as well. Here’s a little bit of a different version of the first salad. 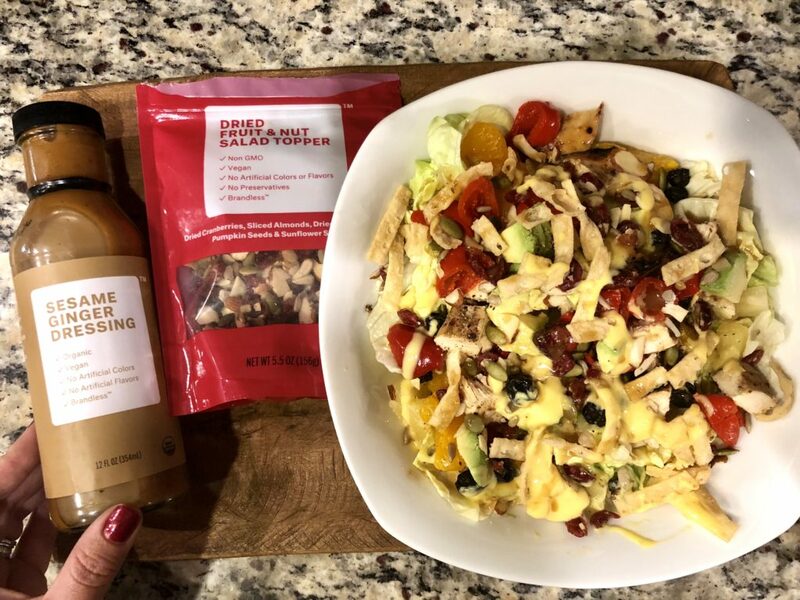 This one has peppadew peppers and the Brandless dried fruit and nut salad topper. And it also has the organic sesame ginger dressing again. Can you tell I’m a big fan of the dressing? New this month they also have tons of new kitchen tools and utensils that includes knives, cutting boards, and bakeware! And everything is $9 and UNDER! WOW! I’m so impressed with this baker’s bundle. 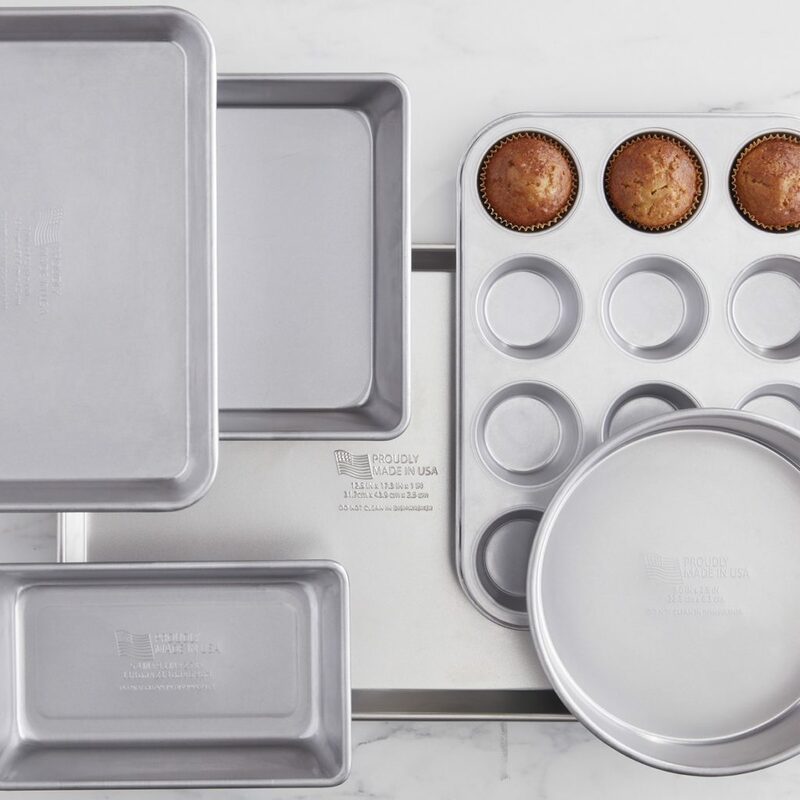 For just $54 you can get 6 pieces of professional grade MADE IN THE USA bakeware! And if you are interested in their cleaning products (spoiler alert: they’re awesome), click HERE to see me talk about my favorites, including their granite cleaner! A big thanks to Brandless for awesome products and for sponsoring this portion of the post. These two furry guys that live with us are definite favorites. They bring us so much joy. 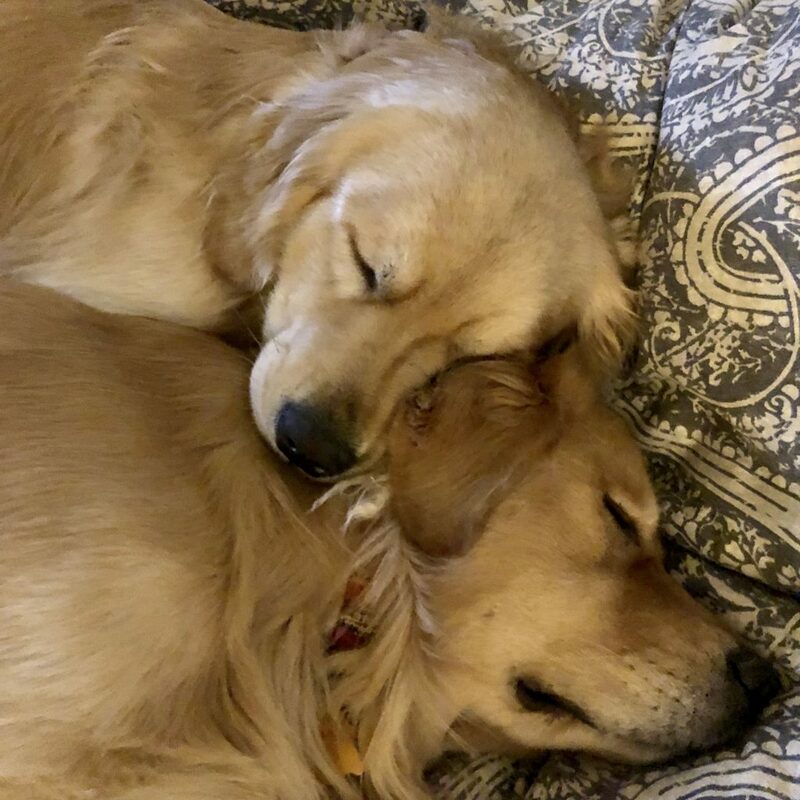 And they love each other so much. This sweater is a current favorite of mine. I grabbed it several weeks ago, and I’ve worn it at least 3 times already. I haven’t taken a pic at home yet, but I grabbed this pic while at the mall last week. 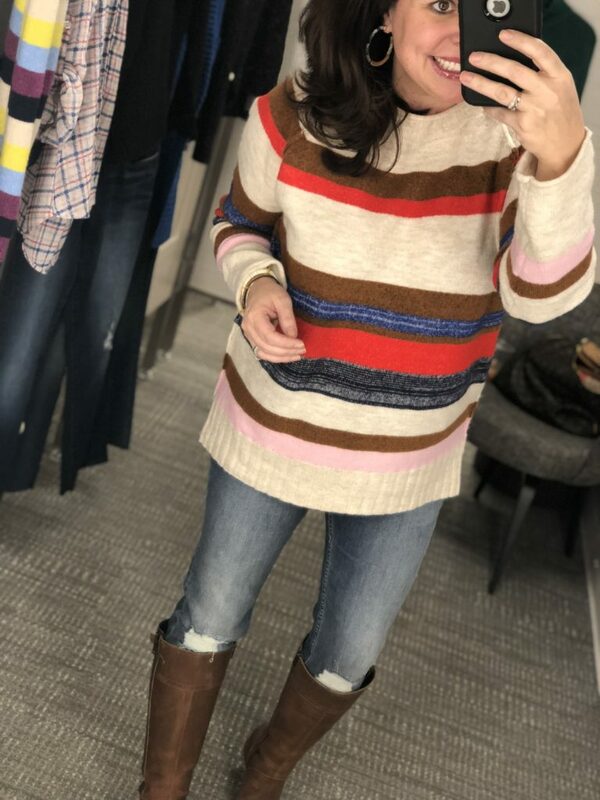 I had a dressing room full of clothes, but didn’t like any of them enough to share them with you, so I thought it was a great opportunity to take a pic of a sweater that I already owned (and wore to the mall that day)! I love this stripe combo, but it comes in 12 solid colors as well! For size reference, I’m wearing a small and it’s still over sized. You might want to consider sizing down. I was going to make this a whole post, but I ran out of time this month, so it’s just going to get a spot in my favorites! Every month I’m going to start sharing what the Top 5 most popular items were from the blog for the month! Now, these numbers don’t include the Gibson x Hi Sugarplum Resort collection, because that data isn’t in yet. *** 5th most popular item HERE. Hint: These are a pair of shoes I bought earlier this year, and they sold out in a hot minute. When they released them again with new spring colors, I knew y’all would want to know immediately! *** 4th most popular item HERE. Hint: I just talked about these for the first time last week. And they have a ribbon. *** 3rd most popular item HERE. Hint: This item rhymes with lardigan. #icrackmyselfup And it’s ONLY $25. *** 2nd most popular item HERE. The color of this item is the name of an animal. And it’s ONLY $20. *** 1st most popular item HERE. The #1 item has tummy control built in. This is how I know y’all are my people. Did you see my Bachelor posts this week? They are always a favorite for me! Click HERE for Part 1. I was legitimately worried for this girl’s spine. Click HERE for Part 2. I was legitimately about to have a panic attack about the shoes on the bed. 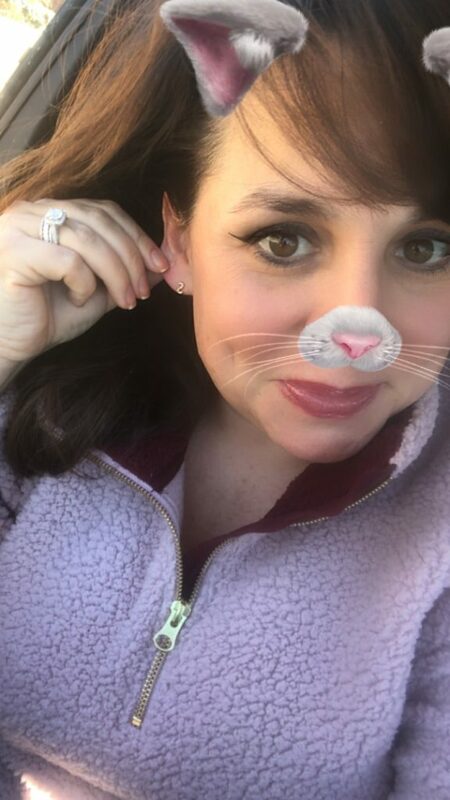 If you haven’t grabbed the blingy initial earrings for $8, click HERE for the code and to see why I love them so much! I love them all year round, but they would make a wonderful little gift for Valentine’s Day! They are adorable. 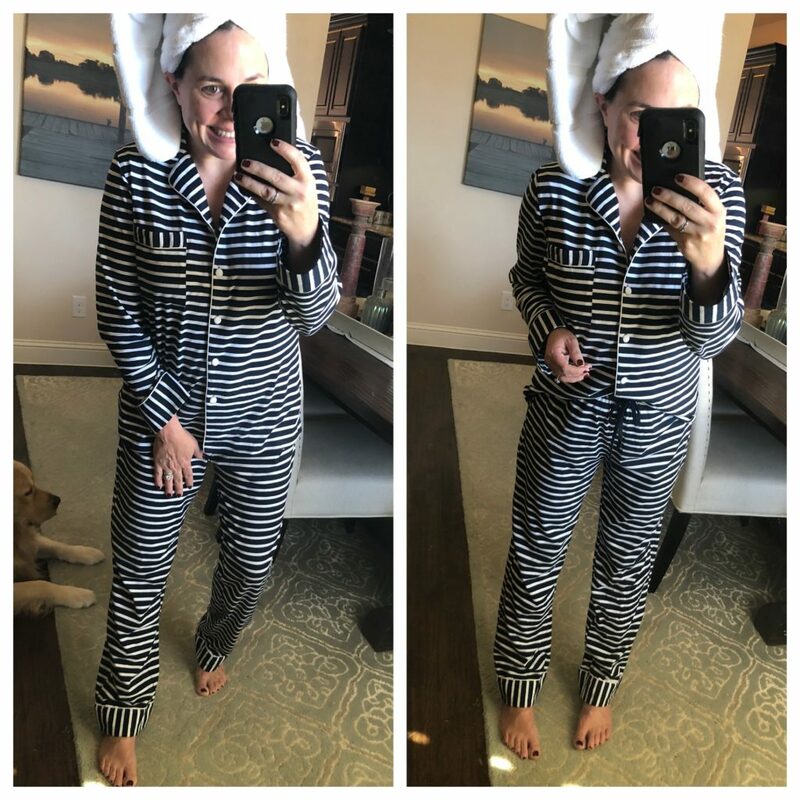 I’ve shown you these before, but I can now confidently say that these pajamas are a favorite! I’ve owned them for a couple of months now, I’ve washed them countless times, and they are awesome. They don’t ball up, they don’t pill, and they don’t shrink. And they look and feel brand new every time I put them on. I TRULY LOVE THEM. They seem to be better quality than the J Crew pajamas that I’ve loved in the past. I’m wearing the dark blue stripe. As always, I ordered a medium in the pajamas because I never want to be wearing pajamas that are too snug. If you have a smaller chest, I think you could stick with your regular size and be just fine. You can find my pajamas HERE. They also have shorts sets and a different type of pants set that’s more like a long sleeve v neck tee than a button up. Another favorite is all of the e-mails I’m getting from y’all about my Amazon posts! I was hesitant to do the first post because I wasn’t sure if y’all were going to be excited about jumping on the Amazon train, but you’ve made it clear you do like having Amazon posts monthly as well as items sprinkled in here and there. You can find all the Amazon posts HERE (it’s a tab at the top of my the blog) if you ever want to scan them again or if you think you missed one. Many of the e-mails I’ve received are about this bag insert! So many of you have said you’ve now purchased more than 1 for different size bags you already owned. BLACK HOLES NO MORE, Y’ALL! I got the beige Style 3, size Medium. It fits easily into my Savannah tote from Barrington, and I realize now I could have gone bigger. And not only does it organize all my things perfectly, it also gives a nice structure to the bag. 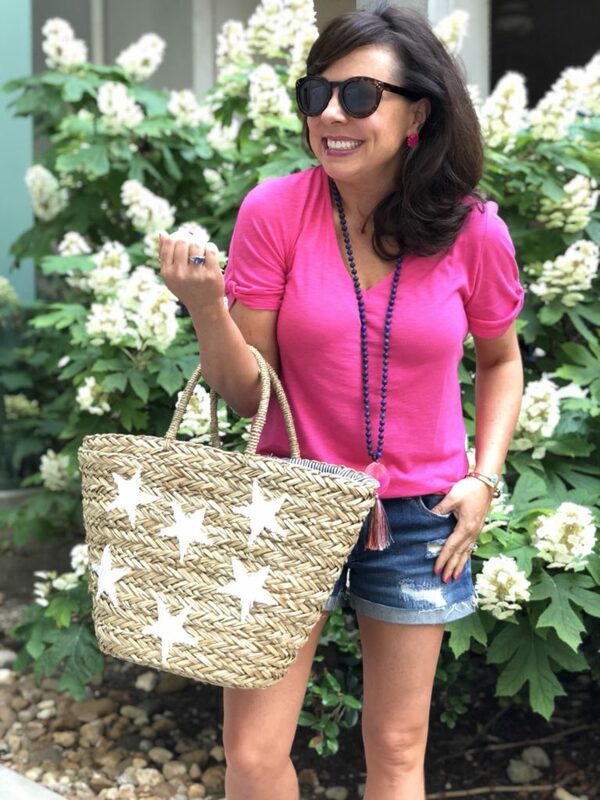 In addition to e-mails, I realllllllly love it when readers send me pictures of themselves in items that I’ve recommended that they are loving too! Look at this cute pic I got this week. Thanks, Heidi! The top is under $20 and the earrings are under $10, both from my last Amazon post. Click HERE to see what my other favorites were. Like the camel sweater (for only $20!) that I think everybody needs. It was the #3 favorite item for the whole month, and I styled it 2 ways in the post. I’ve had several people asking for Valentine’s Day tops, and I found a couple on Amazon that are super cute and great deals, but the sizes are going fast! 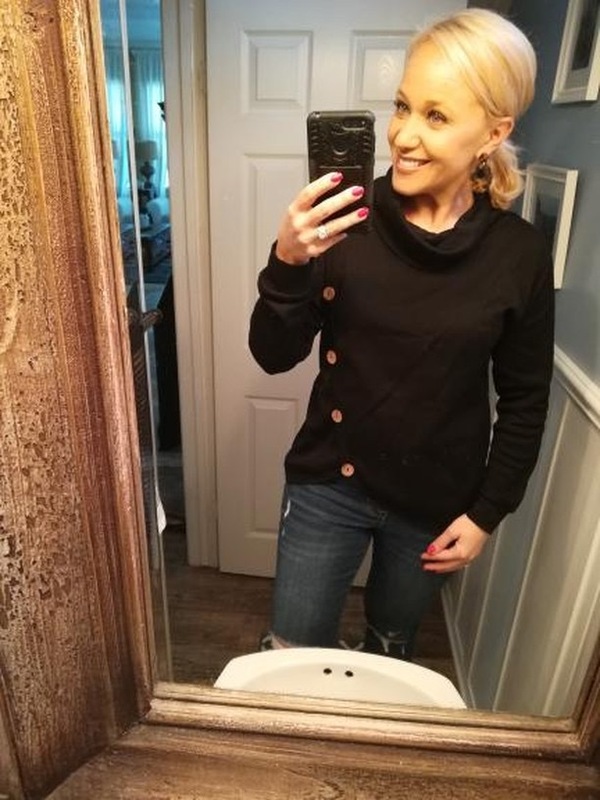 Like this heart sweater that comes in several colors and is UNDER $30. If you want to go more subtle, there’s just this soft terry sweatshirt in a really pretty blush color. 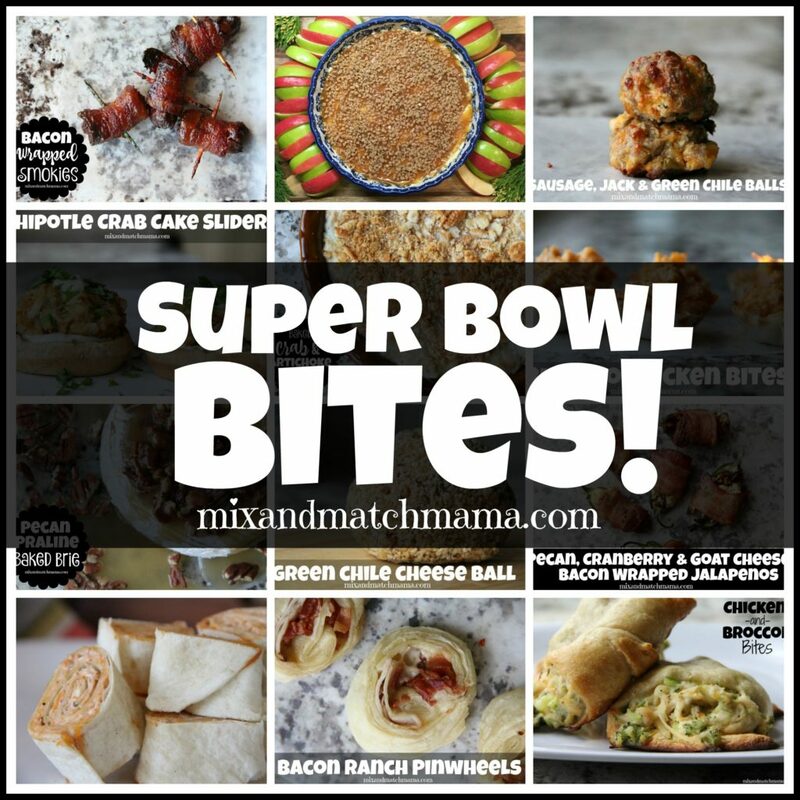 If you are needing ideas for recipes for your Super Bowl parties this weekend, click HERE! Shay has so many delicious recipes that are bound to be hits! YUM!!! Have a wonderful weekend with your people! I’ll see you back here on Monday! Ah!!! My Super Bowl Bites!!! Yay!!! Thank you for sharing!! When I saw you the other day in that striped sweater with the tall boots, you looked so darn cute! Those lilac jeans are absolutely adorable! Great list of favorites, friend. All those clutches you paired with Cassie’s collection are my favorite. So stinkin’ cute!! So many great favorites today! 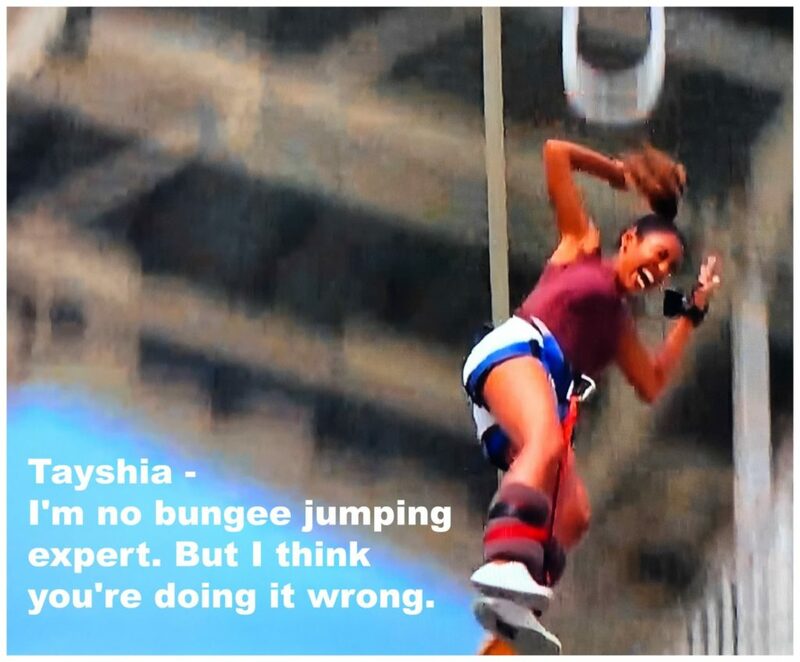 One of my favorites is reading your Bachelor recaps. You are so funny! Have a great weekend! Do you put the pajamas in the dryer or hang dry them? Wonderful post as always!! Shoes on the bed terrify me!!! !😂😬 So glad to know I am not the only one. I am ordering these tennis shoes! I love all of your fashion advise! Who would have ever thought of amazon for clothes. Question, the link for the wood and raffia clutch only brings up a black and yellow one. Does that mean the black one is sold out. Thanks for sharing the most popular items—that’s really helpful! Of course I want to know what everyone else has bought and loved! The ribbon sneakers are next up for me!! 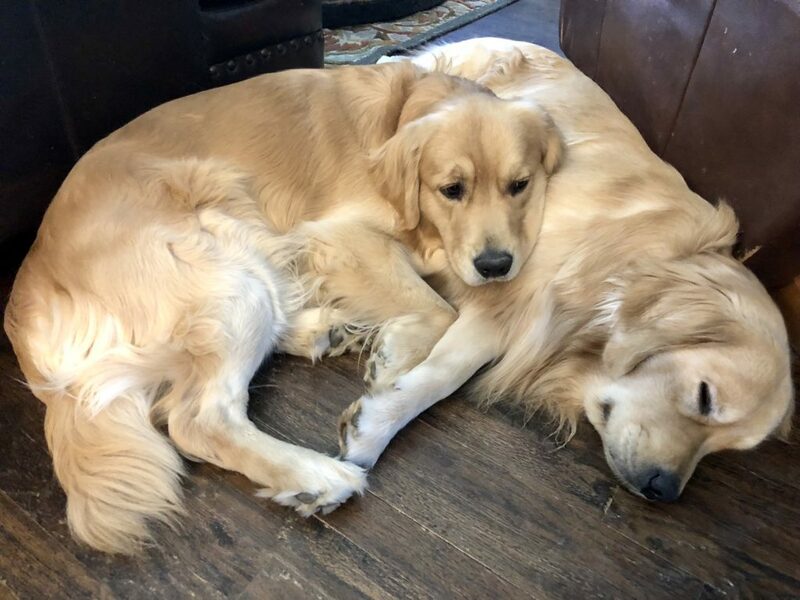 I love all your favorites, but I must say my top contender is your dogs! They are gorgeous! 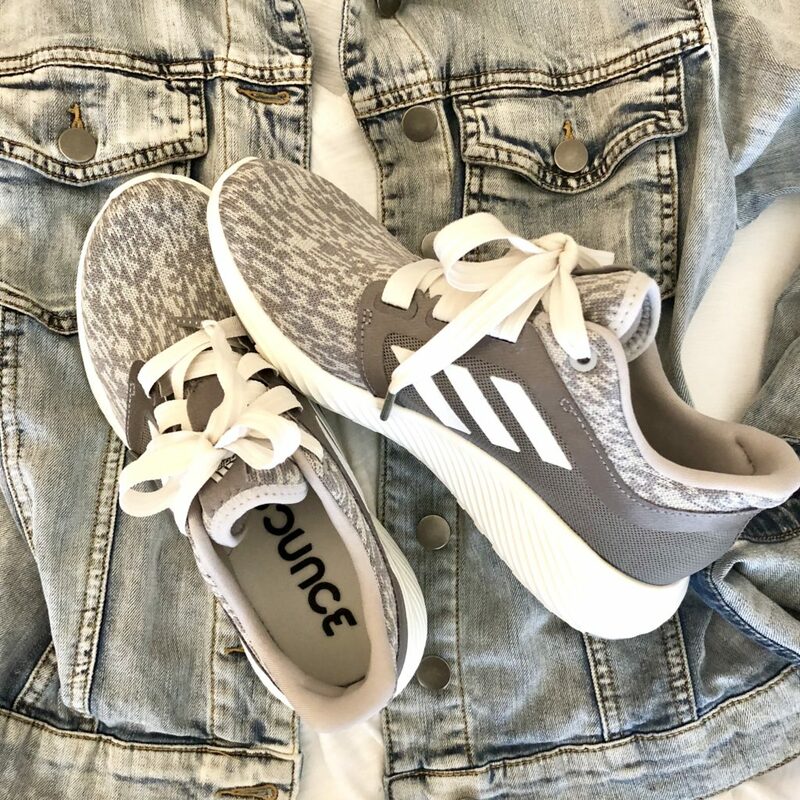 Those Adidas are SO CUTE and I’m loving all of your flat lays!!! SO GOOD! Hi Shaffer – not sure how this blog stuff works but sometimes when I go to order from link on your site – Nordstrom – it says not available at this time. When I go to Nordstrom direct – it works. I try to come back to your site to order since that’s where I heard about the product. Just FYI – I want you to get credit for the sale but sometimes it seems to not work. I bought the embroidered top in black and white. I ordered it in both a medium and large because I wasn’t sure of the size. I’m keeping the medium. Thanks for showing us great vacation clothes!! Cassie’s resort line is SO cute!!! And I’m intrigued by brandless…going to browse now. Hi! Always love your posts! In Pick #2 can you give me a link to that adorable colorful clutch in the bottom right picture? Thank!